Brandon Sistrunk, a father of four, is a staff sergeant in the Air Force, and he is currently deployed in Iraq. Because of the sacrifice, he has made for his country, he couldn’t be home with his wife and kids for the holidays. His wife Ashley, located in Colorado Springs, decided he would still be in the card, even if she had to take a big creative leap forward. 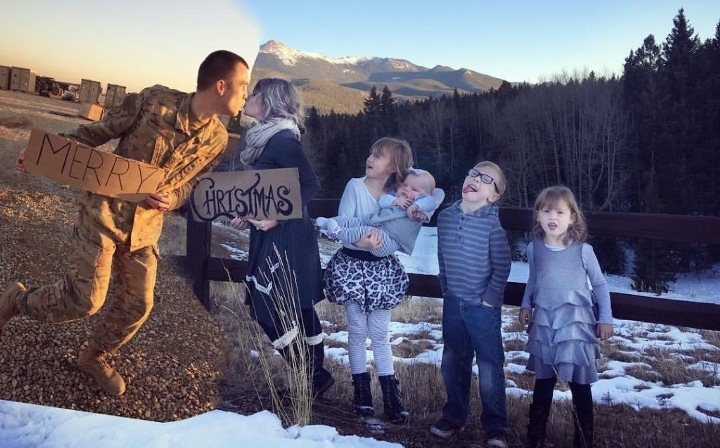 Ashley’s mother took a photo of her and the kids, and a military friend took a picture of Brandon. With some edits in Photoshop, she was able to stitch the two images together pretty seamlessly. Ashely admitted to KKTV that having a husband in the military brings with it some big sacrifices, but that she wouldn’t change it for the world. She offered more insight on her Instagram page. Brandon is set to come home to his family in early 2017.